Both banks, right and left, are closed for any traffic right now. And if you’re in Paris, take advantage of this exceptional situation and have a walk along the Seine, on the parts, that is, that are still accessible. The feeling is just amazing: the water, usually running one or two meters below, has really risen. The water level has reached 3,81 meters above "normal" but it is expected to rise a few more centimetres in the coming hours. So you better give up your plans for cruising the flooded Seine: most of the tourist shuttle services like "Batobus" were shut down as the river flooded the stops. 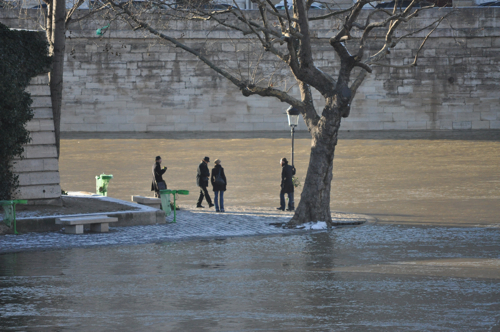 You might wonder how Parisians do measure the rise of the Seine water. Well, the best indicator is the zouave, a sculpture on Pont d’Alma representing a soldier who fought the Battle of Alma during the Crimean War: when the guy gets wet feet, you can start to worry a bit. 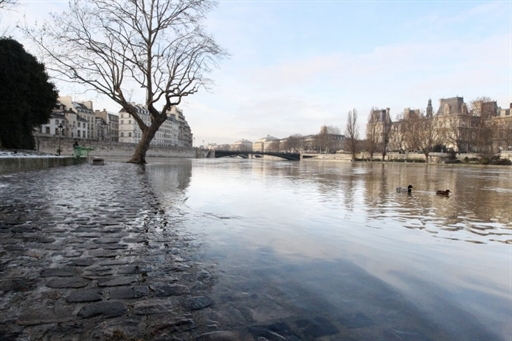 What is for sure: we won't see anything like the Great Flood of Paris in January 1910, when the Seine completely flooded Paris and several nearby communities.